Paul Barden Roses: Recognize this? Very interesting! How does its fertility compare with Basye's Purple? I have wondered how BP would perform as a parent, and based on a passing comment in a previous post it sounded like it was a bit of a problem. Its too early to tell if this plant has merit as a breeder. Basically, I have ignored it for years until this Spring, collecting only some open pollinated seeds from 2008. I won't know until next year if it has any ability as a breeder. 'Basye's Purple' doesn't form seed, in my experience, and I believe it has limited fertility as a pollen parent. I seem to recall that some friends have tried working with it and they reported that the seedlings they got were stunted and very unhealthy. I could be wrong, but that's my recollection. I wouldn't mind trying the pollen. Does the shape of this bush look better than Basye's Purple. Mine is very leggy and rather ugly. I have thought about using Little Chief. I don't know how it would do in zone 5 beside the fact that I don't think I could get it anywhere anymore. I do like its parentage though. 'Basye's Purple' for me does form seed if sparcely. Its pollen that has to be taken very soon is abundant and working with an appropriate mate. 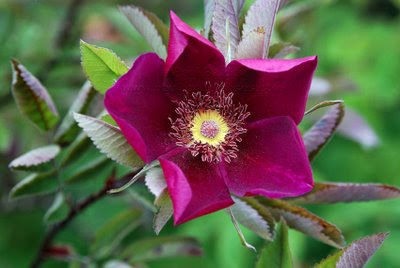 BP darker color is achieved combining rugosa and foliolosa. I stated years ago that I got many BP colored plants from foliolosa x rugosa simple or double. Wild foliolosa apparently never show these darker shades. These shades are closely linked to red stems and redish foliage with a shorter life that makes the plant look leggy. Along this line eight years later I am still trying for darker seedlings with better foliage. Some progress is made. Hope you find a better path Paul. Do you have photos of any of these which we can see? They sound very interesting indeed! In the wild R. foliosa is white, sometimes pink. The one we have is 'wrong'. I have sevral seedlings in test I got from BP's 'cousin', Ann Endt. Paul, I am very intrigued by this plant. Would love to see add'l photos. Rogers Roses illustrates a red flowered R. foliosa, btw. It appears that R. foliolosa takes pollen from most anything and the result is often roses that look at lot like my seedling, and 'Ann Endt'/'Basye's Purple'. I suspect many of the cultivated specimens of "R. foliolosa" are in fact hybrids. As others have pointed out, the true species is pale pink or (more often) white.